I am getting Ubuntu base update almost every day. This seems strange to me. What am I missing? Ubuntu base is a group for the tools and services and core parts of Ubuntu and the following applies equally to any software installed. It's normal to have Ubuntu base updates more often. In Linux, security flaws are found much easier when they exist due to the code being open. Then the patch is immediately put upstream and onto your computer through the package update. Whereas in a closed source system, often such flaws aren't found until exploitation. Its just a matter of when the security flaw is found, not the existence itself. You can compare your configuration against the list of updates here. The list seems quite in sync with the official reports. Needles to say, to get the right picture, don't forget to apply the proper filtering corresponding to your PPAs, in case it's wrong. Like the other answers say, this seems normal. If the frequent update reminders bothers you, you can set up automatic security updates. If it gets annoying you could change Security Updates in your update setting to how long you want. After that time it would show you if a new update has come. Not the answer you're looking for? Browse other questions tagged update-manager release-management or ask your own question. What is Ubuntu base update? Where can I look up my update history? 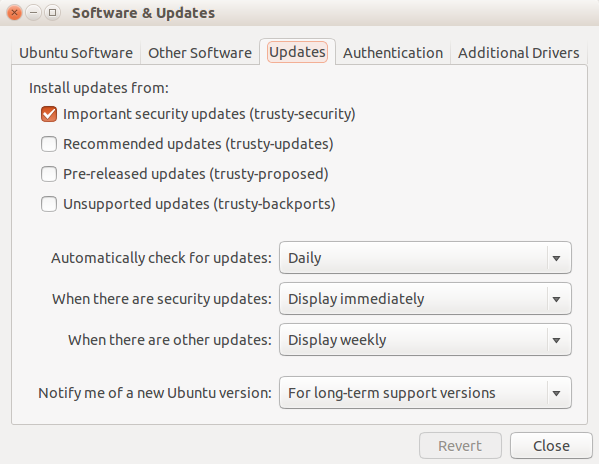 Is it required to update Ubuntu every day or week? How to prevent a kiosk running Ubuntu 13.10 showing the update dialog popup window? Kubuntu 17.04 How to do fully automatic update with discover?